“How Do Dinosaurs Learn Colours and Numbers?” is a picture book divided into two sections, predictably for numbers and colours. The first section covers all the primary and secondary colours plus brown and pink one at a time, as well as white and black together. It ends with a double-page spread on rainbows. The second section introduces the numbers one to ten in order and ends saying that the dinosaur will count again. It isn’t the most thrilling ending to a book. In the section on colours, the word for the colour is actually printed in the colour itself with a fine black outline so that pale colours still stand out clearly. There is only a limited amount of text on each page, so it is easy to concentrate on a counting or colour recognition activity as well. As far as actually learning colours and numbers, however, this book leaves a lot to be desired for me. The emphasis in the pictures is all on the dinosaurs, and the coloured objects or objects to be counted seem to play a minor role. The first double page, for example, deals with the colour red; it shows a huge gorgosaurus holding a fire engine that is only around six centimetres long. The pink ball is even smaller, and a brown circle on a calendar page is a rather insignificant detail. Unfortunately it’s the same story in the section on counting. The three toy trucks are only about two centimetres long, with a huge triceratops towering over them; the seven cars are even smaller. Mark Teague’s illustrations of the dinosaurs are impressive. There are about eighteen different types of dinosaur featured throughout the book, and each one has its name printed beside it for identification. Most of them have toothy grins and are shown building a tower out of bricks, playing with toys and so on. The frontispiece is delightful, depicting ten dinosaurs eating pizza, blowing bubbles and playing cards on a bed among other antics. The illustrations of people are not, however, as interesting as those of the dinosaurs. The main drawback to me, however, is that so much more could have been done to emphasise the colours and numbers that are intended to be the main focus of the book. The toy trucks could have been big enough to ride on, for instance, and the ball could have been the size of a beach ball. 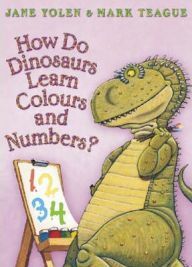 “How Do Dinosaurs Learn Colours and Numbers?” would be an ideal picture book for a child aged between two and four who is obsessed with dinosaurs. I have known children of three or four who are capable of learning dinosaur names such as triceratops and tyrannosaurus rex because they are so interested in them. If your main objective is to teach your young child numbers up to ten and colours, however, there are many other books that are much more helpful and engaging. Picture books with stories often have illustrations that provide intriguing opportunities for counting, even though that is not their main focus. Jane Yolen and Mark Teague have published a series of several picture books about dinosaurs, dealing with how they say goodnight or how they eat their food. There is also one entitled “How Do Dinosaurs Get Well Soon?” which was once chosen as Children’s Book of the Week by the Sunday Times, so some of them must be more inspiring than the one I’m reviewing. If you have a young child who is fascinated by dinosaurs, “How Do Dinosaurs Learn Colours and Numbers?” is probably a worthwhile investment. If you are looking specifically for picture books that teach numbers or colours, however, you are sure to find a many that do so more successfully than this one. One Comment on "How Do Dinosaurs Learn Colours and Numbers?" Perhaps they should have had baby dinosaurs in the pictures – as well as giving a better scale to the pictures, it would make sense for little dinosaurs to be learning their numbers and colours, adult dinosaurs should already know it all!! !